Node Transducer is a block added by the Thaumcraft 4 mod. It allows to charge Aura Nodes for them to produce CV. In order to charge the node, place a Node Stabilizer under it and a Node Transducer above, then power the transducer with redstone and wait for the node to be charged. To uncharge the node, remove redstone signal from the transducer. Do not break the transducer while the node is charged or the node will explode. A Node Transducer, when placed above an Aura Node and used to energise it as described above, causes the node to supply a continuous and inexhaustible stream of Energized Vis to any device within 8 blocks which can accept it. Energized Vis of all 6 types is needed to fuel the Focal Manipulator, and Energized Aer Vis is needed for the Flux Scrubber. It can also improve the operation speed of the Infernal Furnace by providing Energized Ignis, and the Essentia Crystallizer by providing Energized Terra. 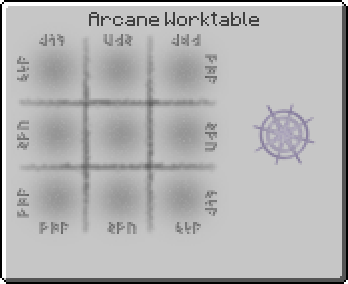 An Energized Node cannot charge wands or other devices directly, but a Vis Charge Relay can be installed over an Arcane Worktable in order to slowly but continuously charge any Wand or Sceptre placed there. Energized Vis can only travel in straight lines and is blocked by obstacles, so there needs to be an uninterrupted line of open space between the Energized Node and the receiving block. In order to extend the range of the Energized Vis beam and route it around obstacles, a line of Vis Relays can be used. Each one has a range of 8 blocks and can channel Energized Vis to multiple recipient devices. It is also possible to "tune" relays to different colours, which doesn't change which types of Vis will flow through them, but does stop them to connecting to differently coloured relays. "Without vis nodes thaumaturges would not even be able to perform the simplest of tasks, but the nodes themselves have several limitations that make their use impractical for extensive operations. Foremost amongst these limitations is the fact that they are easily depleted and it takes quite some time for them to once again gather energy from mystical source they are connected to. You think you may have found a way around that limitation. In effect nodes are tiny gateways to a mysterious font of mystical energy around which the energy slowly accumulates in the form of Vis. The gateway is so small that only a tiny amount of energy leaks into our reality. By levering open this doorway you can cause vis to pour forth in a torrent. This is even more dangerous than it sounds however and careful steps must be taken during the entire process. Firstly the node needs to be stabilized during the entire process. Once that is done you need to craft and place a §lNode Transducer§r above the node. When you apply a redstone signal to the transducer the node will begin converting to an energized node and quickly lose its stored vis in the process. The process takes some time, but when it is done the node will change into an energized node. Caution should be taken to keep both the stabilizer and transducer active from now on. Energized nodes no longer store or recharge vis, nor can vis be drawn from them with a wand or other means. Instead they produce a steady supply of CV (centi-vis, or a hundredth of a vis) each tick. This energy can be tapped by placing vis relays near the energized node. anything that needs it, like the Infernal Furnace. Relays use a branching system, so each relay can have only one source (either another relay, or an energized node), but may have multiple child relays that branch off it. You can also 'tune' a relay to one of the primal aspects by using an appropriate vis shard on it. Clicking on it with a wand will also cycle through the possible attunements. This does not limit what vis can flow through that relay, but does prevent it from connecting to any other relay except untuned ones or ones tuned to the same primal. The amount of energy a node produces per tick is finite so attaching too many devices to a single source might exceed the amount of CV it can produce. It is possible to turn an energized node back into a normal node. Simply cut the redstone signal to the transducer and it slowly turn it back into a normal node. Caution should be taken however since the node will be completely drained of vis and thus runs the risk of being damaged." This page was last modified on 17 January 2019, at 12:54.